I’m a person who refuses to work out in any traditional fashion who also enjoys following exercise encouragement on Facebook. Silly, isn’t it? I know it’s a common joke, but if you did see me running down the street, seriously—there would be an emergency! Like, stop me. Offer to call 911. But when I sit in front of my computer, a manuscript open in one tab and my internet open in another, I get this rush of “YES! !” when I read exercise encouragement. Dwayne Johnson is particularly good for this. He’s very funny, and talks about being the hardest worker in the room. And I can identify with that… more figuratively speaking. Sometimes I’m asked how much I make an hour in my writing career, and I laugh out loud! An hour?? I refuse to do that math because it would only bum me out. Writing is hard work, and it takes hours and hours on end of fingers to key board. Then there is editing, editing, editing, the endless hours of walking around in a daze wondering how to get myself out of some corner I’ve written myself into… Writing is a lifestyle, but it’s also a job, and if you don’t treat it like a job, you’ll be hard pressed to achieve anything. So I press on, keep at it, sit down every single day in front of my computer and push forward. I don’t want to write one book a year, I want to write five! 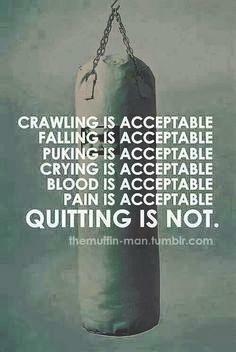 So falling and crawling are definitely acceptable, if that’s all I can squeeze out that day. Puking, crying, blood and pain? Yikes. Go see a doctor. This is figurative! But quitting… No, that’s never an option. And neither is writer’s block. Deep breath, another cup of tea, and back at it. LOL! I love surprising you, Angela! 😀 Fingers crossed we can keep clear of the flu more effectively this year. I’d planned to do one book a year, but that hasn’t happened yet. I’m still plugging along. Keep going! It depends on the type of book you’re writing, too. I think it comes down to persistence. You are lucky to be able to do it full time, keep at it!